Whenever I visit Manly I get the exhilarating feeling of being on a holiday in my own city, whether it is snorkelling off Shelly beach, strolling down the bustling main street, or simply sitting by the beach and watching the world go by. 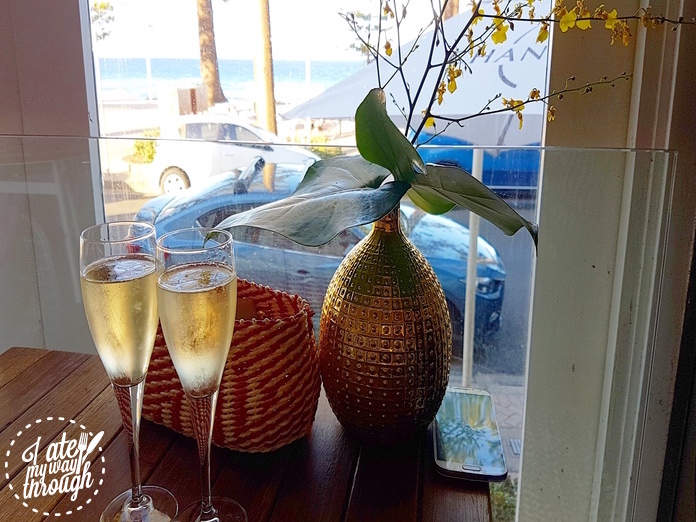 On a warm sunny evening, I found myself seated by the window in Manly Wine, sipping a glass of Yarra Valley Sparkling – a perfect place to watch the roaring waves relentlessly pounding the golden beach. The decadent evening didn’t’ stop at the bubbly; with nearly ten pages of domestic and international varieties ranging from Hunter Valley (AUS) Semillon, Marborough (NZ) Pinot Gris, Santa Barbara (USA) Syrah to Tuscany (Italy) Sangiovese, the wine list is extensive to say the least. Whether you prefer New World wines from the United States, Australia, New Zealand or have developed a taste for traditional Old World varieties from Italy, France, Spain and Greece, you are bound to find one that suits your palate and quenches your thirst. The wine list also has a special emphasis on Rosé with varying intensity in colour and taste. On recommendation from the knowledgeable staff, we settled on an Eden Valley Riesling ($10/glass) for our meal. 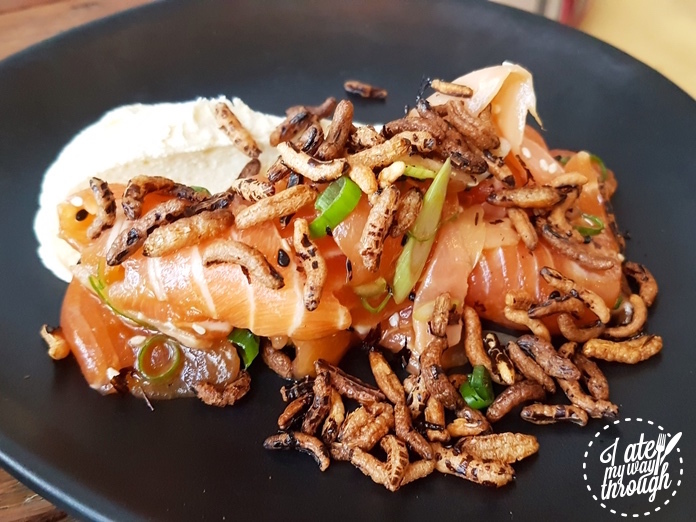 The menu features modern Australian cuisine with a strong seafood focus, ranging from raw to cooked, small to large platters. My travels in Italy a couple of years ago broadened my horizons to appreciate how less is often more when it comes to food. 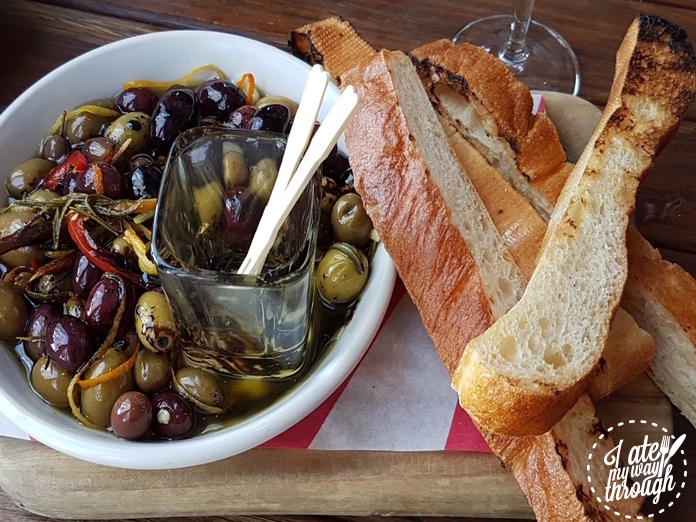 A plate of olives or a few pieces of bread with balsamic vinegar and olive oil can be the best appetiser. However, never had I experienced the combination of both served in one dish – Organic olives served in a balsamic and olive oil dressing with grilled flatbread on the side ($10). If we drink lemonade with slices of lemon, why not eat olives marinated in olive oil plus a dash of vinegar? Admittedly it took me a few years to acquire the taste of olives. 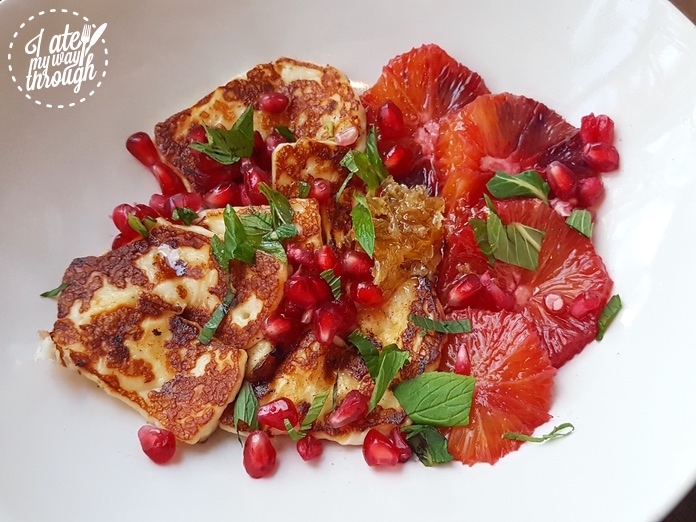 The next appetiser, however, is undoubtedly widely popular – salty haloumi cheese matched with sweet honeycomb, served on a bed of ruby red pomegranate seeds, blood orange, and a sprinkle of torn mint leaves ($18). It’s almost too well presented to break into, but I was smacking my lips at the thought of the extraordinary contrast between salty chewy cheese and sweet gooey honeycomb. 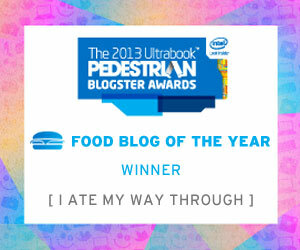 A few photos later, both eyes and palate achieved total satisfaction from this stunning dish. The full venue is subdivided into multi-purpose indoor and outdoor dining areas with a total capacity of up to 250 people. We were totally content at our window seats in the north side however – the gentle sea breeze and lovely warm sun separating us from the mundane daily grind a thirty minute ferry ride away on the other side of the harbour. I took another sip of the dry crispy Riesling when a small platter of Salmon Sashimi ($19) arrived at the table. The evidence of Japanese influence is obvious with Ponzu, Mirin, pickled ginger, and wasabi; but what sets this dish apart is the crème fraiche and puffed wild rice. The crème fraiche neutralises the pungency of the wasabi and the acidity from the Ponzu while the puffed wild rice adds a crunchy texture. Crustaceans have become a staple of many people’s diet these days – mine included – so I am definitely not complaining about the next two courses: Salt ‘n’ Pepper squid ($19) is an oldie but goodie, with a Thai twist of papaya claw, mint and chilli. 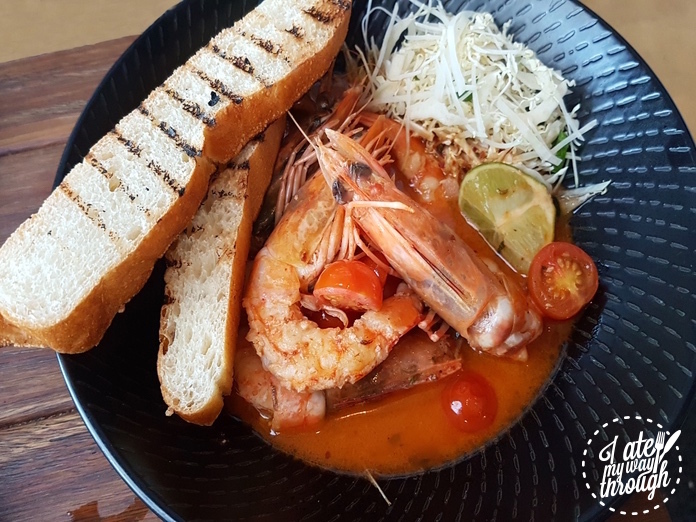 Yamba king prawns ($34) are renowned for being the biggest, the sweetest and, more importantly, the tastiest prawn variety. At Manly Wine they are cooked in cherry tomatoes, chipotle and garlic butter, and served with bread on the side. The table became silent for several minutes and our attention was solely focused on cherishing the flavour of the tender meat until every drop of the sauce was wiped clean by the bread. I sunk back in the chair, looked out to the beautiful ocean and the golden beams of sunrays penetrating through the window. Where am I? On holiday somewhere in the Mediterranean indulging myself in top-notch food and vino? It’s totally plausible. Except… I am at Manly Wine, a holiday in my own city.